In some of the most exciting news of this early 2012 season Jesuit high profile athlete Doug Brenner (6-3 280 Sr.) is committing to Oregon. Brenner attended the Oregon St and Wisconsin game yesterday and feels confident about his decision. Doug’s a kid that we got to know early on in his career, and as we have said time and time again he’s even a better person then athlete. The Ducks are getting the full package in Brenner, as he comes from one of the most athletic families in state history. He is freakishly strong and has shattered all of the Jesuit HS lifting records , while also being the first kid in school history to start as a freshman. As we reported last week Brenner got the call from line coach Steve Greatwood, who proceeded to hand the phone to Chip Kelly who extended the offer. Oregon projects him playing the guard/center position, while right now he is playing a combination of TE/FB/DL for the nationally ranked Crusaders. Brenner’s a 3.9 student and someone that the Ducks can look to as a high quality character kid. We couldn’t be happier for the Oregon high school standout, and will be rooting for him in the years to come as the Ducks just landed a gem. 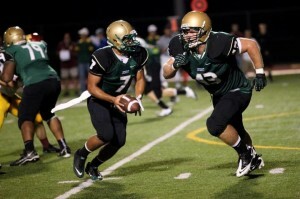 Brenner joins West Linn OL Evan Voeller (6-5 295) and Aloha RB Thomas Tyner (6-1 210) in the Ducks 2013 recruiting class.